Well, as a resident of West Yorkshire anyway. I'll be back next month for a weekend. However, this is the last regular Sunday I'll be at the railway. So I had Druid on the passenger train. There were not a lot of passengers about, so I swapped Druid for Loweco for more of a challenge. 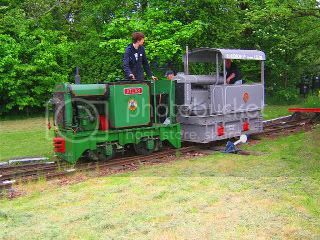 (Druid is so good it doesn't notice the coaches behind it, the Lister is much smaller so pulling the passenger train uphill is more entertaining!) 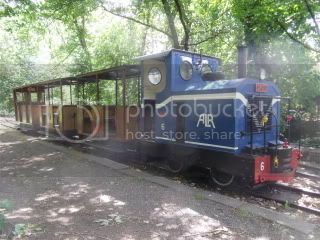 There were not a lot of passengers about, but yesterday made up for it, with record takings in the history of the ALR. This could be the last post for a while, at least until I sort out the internet in my flat, so farewell everyone! 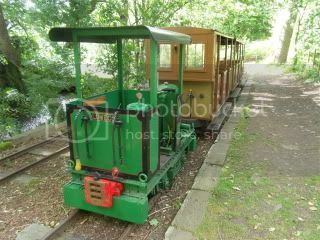 As usual, we operated today to take passengers to and from Kirkstall Festival. This is usually our busiest day of the year, and today did not disapoint, with many fully loaded trains. 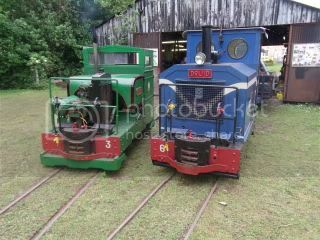 Atlas and Little Ruston were used on the 'Festival Flyer', both running well all day. The Festival Flyer, in full flight up to the Abbey to pick up a full load of passengers. 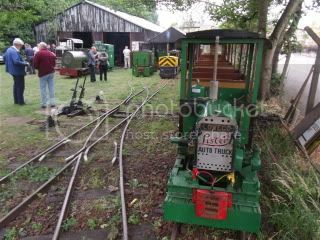 The Baguley has been inspected to see what was wrong with it's engine (after it stopped working when it derailed on Thursday) Turns out whatever it was has sorted itself out, and the engine started straight away. 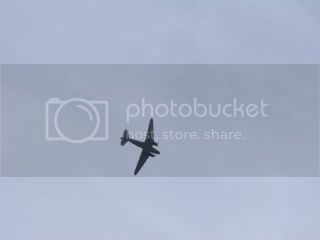 A preserved Dakota DC-3 did a flypast over the festival, and our railway. This photo was taken from just outside our shed. The plane seemed a lot lower in real life! Atlas, complete with Festival Flyer headboard, being admired by a young passenger. And at the other end of the train, Little Ruston. 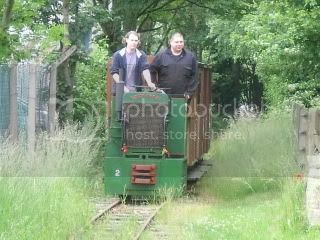 This evening we had the 7mm scale society (narrow gauge railway modellers) visiting. 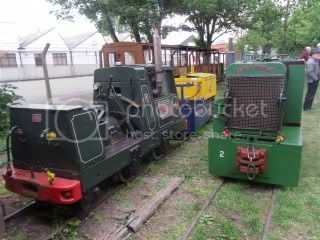 We had all our working engines outside for photographing, and many of them started and on the passenger train. 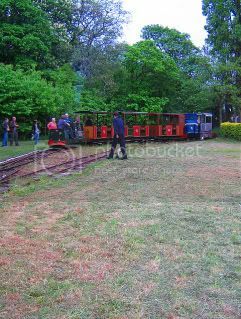 The Gogo tractor made another sucessful run up the line and back, crawling backwards in reverse gear took over 5 minutes. 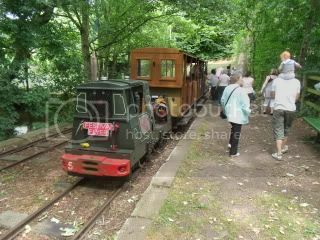 I think our visitors enjoyed their visit, despite a moment when the Baguley decided it didn't like being a train any more and made a bid for freedom, landing at 45 degrees to the track! 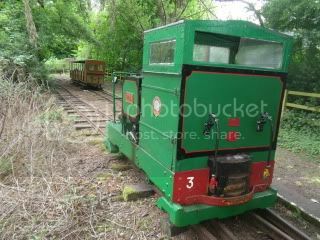 It doesn't look like its suffered any significant damage, but we couldn't get the engine to restart, so will have to have an in depth look at it at the weekend. So everyone look out in the YEP in the near future. ...well, for me at least. 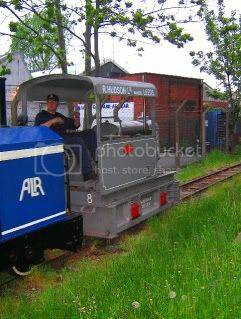 I'm moving to Devon, so after next weekend my visits to the railway will be only occasional. If people send me photos and descriptions of whats being going on then this blog might be able to continue via 'remote control'. ...we'll see. Anyway, today I was using Odin, which ran well all day. 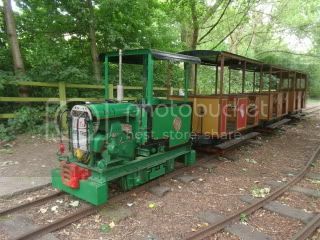 Passengers were a steady stream, it was one of those days when we're never stood still for long, but theres never a decent load on the train. For the last trip, I took the Lister for a spin. A strange thing has happend while I've been away. 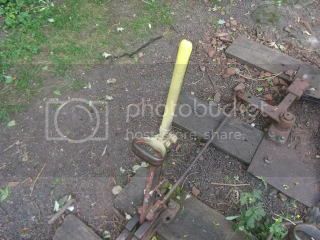 Somebody has spray painted the handle of one of our point levers yellow. Its been done quite intentionally, yet there is no other yellow paint or vandalism of any kind to be seen. odd. 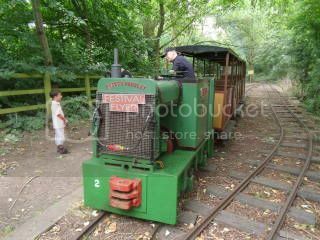 Next weekend, we'll also be operating on Saturday, as it is Kirkstall Festival in the Abbey grounds. 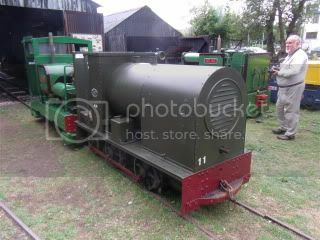 ...I havn't been at the railway, but Justin sent me these pics of what was running. 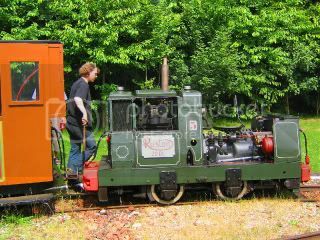 20th June, Little Ruston was in action on the passenger train. 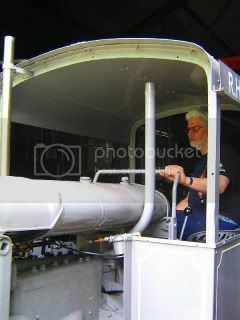 The Gogo tractor was out and running, with my Dad at the 'wheel'. 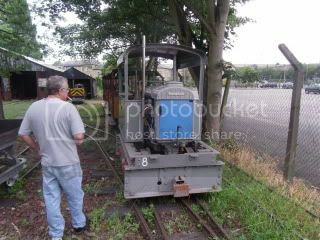 27th June, the turn of Atlas again, seen here shunting the Muir Hill chassis out of the compound. 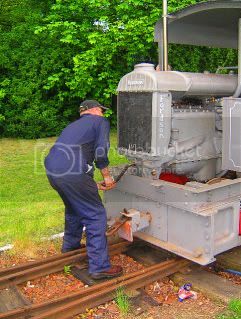 The O&K's gearbox is now being finally reassembled, with the new sump, once this is done it can be properly bolted into the loco. 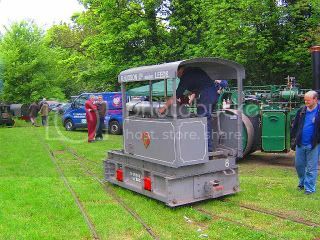 Today's engine was Atlas, which ran well. 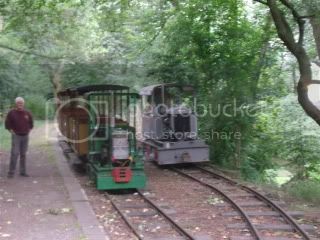 There were not too many passengers, but enough to make it worthwhile running. The hot axlebox changed last week seems to be ok now. I also changed a sleeper. turned out to be quite rotton under the surface. The Gogo tractor came out of the shed today to be measured and photographed for a model. Odin's leaky radiator was finally fixed, and it is now back to full health. Here it is seen next to Druid. These two engines started out their lives looking fairly similar to each other, but over time various modifications (especially to Druid) have made them both rather unique. 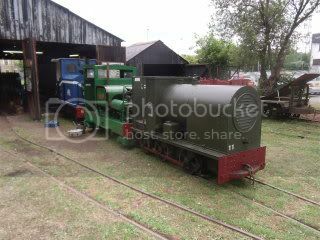 Also today, the Greenbat had it's batteries topped up with de-ionised water, and some work was done on the O&K, although I'm not sure what as I wasn't paying attention. 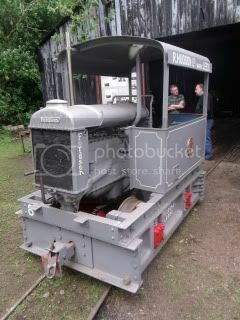 More pics from Leeds traction engine club visit. 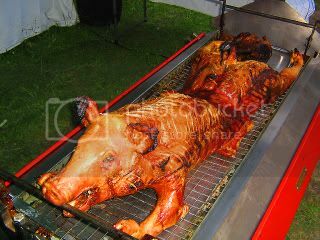 Some more photos from last month when the Leeds and district traction engine club visited to have a hog roast, sent to me by Justin. 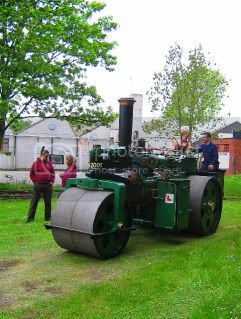 Here is the steam roller that turned up, nicely rolling our yard flat. 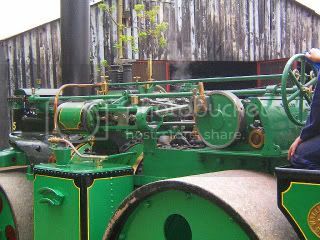 Some steam roller detail. It really was well turned out. 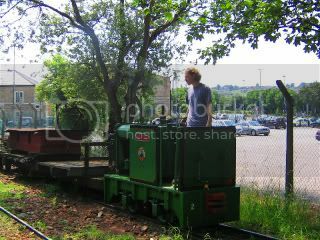 The Gogo tractor manouvering in the yard. Richard reclining in the Gogo tractor on the way to the Abbey. 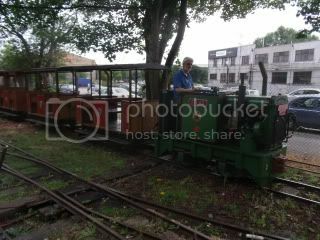 Little Ruston took the train back up the line when it returned (very very slowly) behind the Gogo tractor. 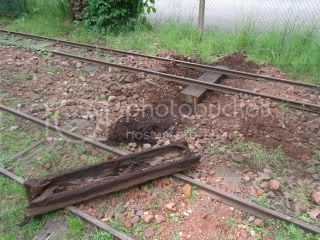 Once the train had gone back up the line, Gogo tractor stalled and wouldn't restart. So me and Atlas towed it away in disgrace.